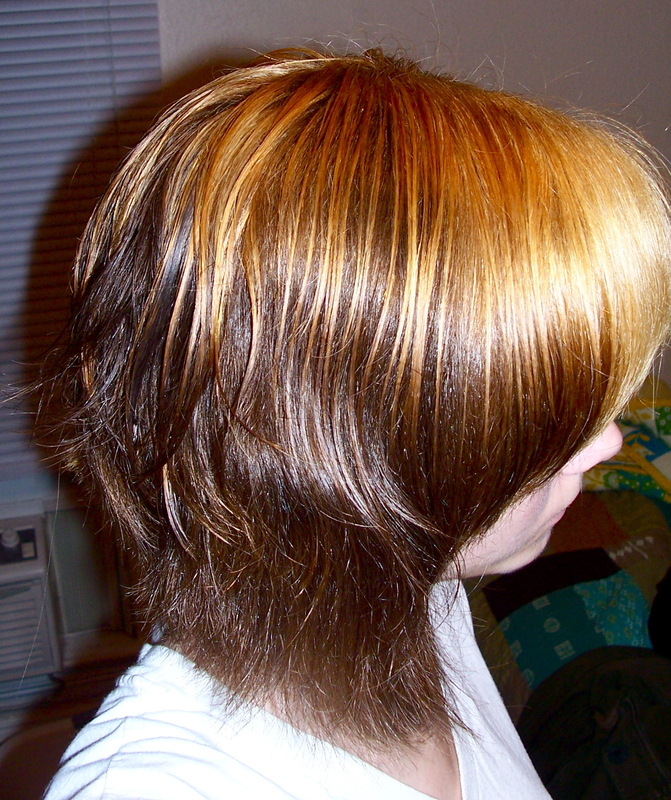 I’ve dyed my hair once or twice before, but this time, since I wanted a ‘shocking’ color, I had to bleach it first. I bought the kit (Splat: Rebellious Colors, in “Luscious Raspberries”) and didn’t notice until after I threw away the receipt that there were no nozzles for the bottles… I searched everywhere for them, no luck. I have NO idea where you could buy just the nozzles, so I decided to go at it without them. Which went better than I expected… sorta. I started out with the bleach, I mixed it carefully, and it got to be a gritty paste, and then I was supposed to wait to let it set. After putting on the gloves that were included, I poured a golf ball amount of the light-blue-goop-that-smells-like-a-litter-box into my palm and started applying it to my hair while standing hunched over our bathtub. Once I felt like I was finished, I had my mom check the back for me, and added more to the areas she specified, finishing off the bottle. The next 50 minutes of my life were a boring and smelly metamorphosis. After rinsing out the bleach mix, I peeked in the mirror and realized that a huge chunk of my hair was barely lighter than my original shade of dark, dark brown. I resembled Cruella DeVil. I was just crossing my fingers that it would look okay once I turned it red. My hair is almost black… black and red go together, right?…?! I managed to splatter the junk on my mom’s wall and floor (I spent quite a bit of time with the bottle of 409.) As well as turning the sink and tub slightly pink (which I know from previously dying my hair dark blue, will come out after a little bit of use.) So I sat on an old towel in the bathroom, noticing that it looked like I’d committed murder with the red smears on my fingers and arm. 30 very long minutes went by, and it was time to hop in the shower again! The instructions say to ‘rinse until water runs clear,’ I never thought that would take even half as long as it did, the water ran bright red, hot pink, baby pink, pastel pink, rose quartz pink and FINALLY clear. 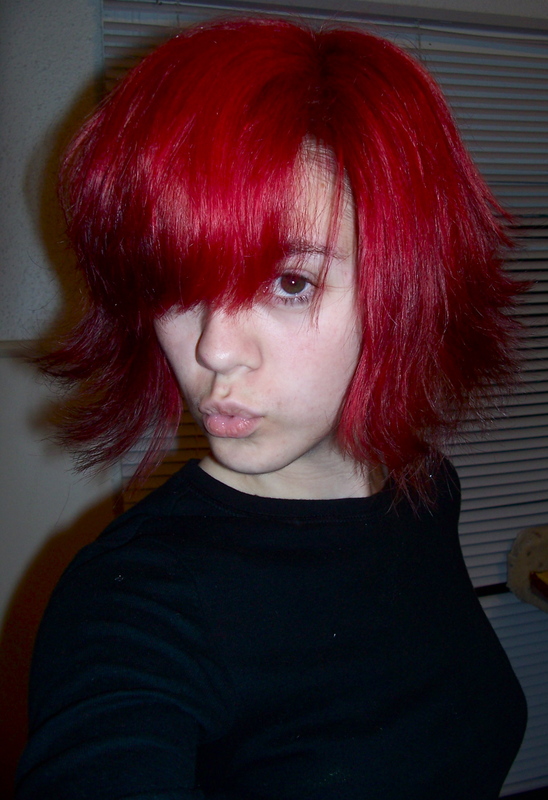 I hopped out of the shower, blow-dried my hair, and SHAZAM: Fire-Truck-Red hair! It leans a little closer to pink than I wanted, I was hoping for more of a scarlet, but I still love it! I took the time to straighten it, which I think looks really wicked, too!